Wholesome Organic Icing Sugar is made from 100% certified organic sugar cane, grown and produced without the use of herbicides, pesticides or chemicals. Our icing sugar is made by simply grinding our Fair Trade Organic Sugar to a fine, fluffy powder (12x) and adding a bit of organic tapioca to prevent clumping. When making simple icing with water, the organic icing sugar gives a faint golden color and delectable mellow toffee flavor derived from the natural molasses retained in the unrefined, unbleached organic sugar. Usage: Try dusting whole grain waffles, french toast, or stuffed crepes for a special breakfast treat. It is perfect for cookies, frosting, fillings, dusting, and baking. Unlike refined white powdered sugar with its overpowering, chalky sweetness, Wholesome Fair Trade Organic Icing Sugar retains a bit of the cane’s natural molasses to give a smooth, mellow and rounded flavor. Many bakers and parents like the fact that this product is corn-free. Organic icing sugar is blended with organic tapioca rather than GMO cornstarch! 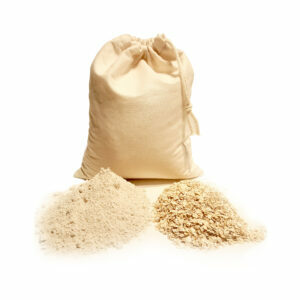 No chemicals, bone char, or animal by-products are used to make or de-colorize this sugar making it ideal for vegans.